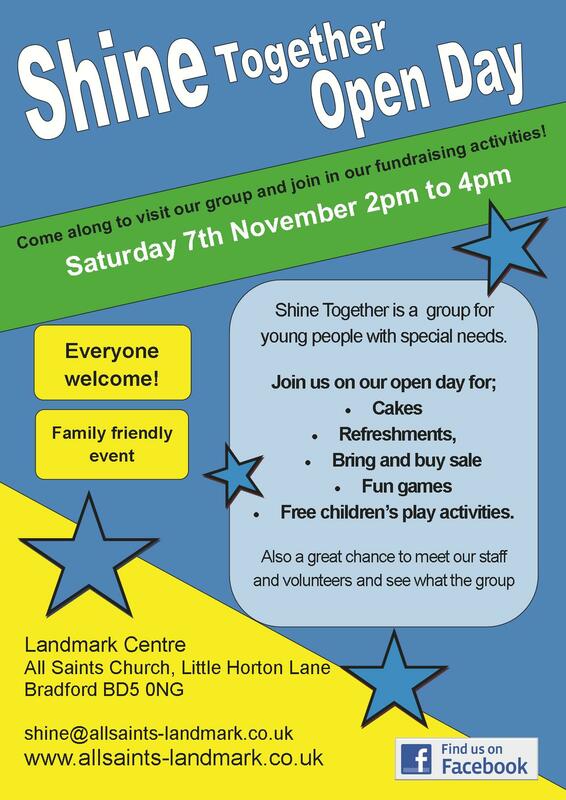 In November Shine Together disability youth group is having an Open Day fundraiser. Please join us from 2-4pm on Saturday 7th November to see what our group is like, meet the young people, staff and volunteers and enjoy our fund activities. Refreshments available; tea, coffee, juice, cakes and savoury snacks. A bring and buy sale with lots of bargains to pick up, please bring along items if you have any. free childrens play activities; make a junk model to take home, free play with large scale construction toys and other games. Any money raised at the event will go towards the Shine group for resources and if we raise enough, a trip for the young people. We would love to see you at our event, everyone welcome! ← Learning To Fly – Ready For Takeoff!